1 high-ranking artist will receive eBook versions of both "Indie Power: A Business-Building Guide for Record Labels, Music Production Houses and Merchant Musician", and "Indie Marketing Power: The Resource Guide for Maximizing Your Music Marketing". Get the power you need to make your mark in the new music economy! 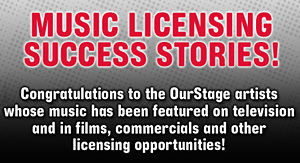 Awarded to 1 high-ranking artist across all Music Channels in OurStage's monthly competitions; Prize awarded according to the OurStage monthly competition terms and conditions; Airplay cannot be guaranteed.